Which statement is true by the transitive property of congruence? What is the term for a pair of angles that add up to 180 degrees? Which angle is adjacent to [math]\angle CBD[/math]? 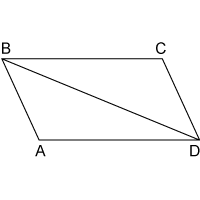 What geometric term names the top and right side angles in the figure shown? The pair of angles shown sum to [math]180deg[/math]. What type of angle pair do they form? What type of angle is shown? Angles that have a common side and a common vertex. The sum of their measurements is 360 degrees. The pair of angles shown sum to [math]90deg[/math]. What is bigger than a right angle? What is smaller than a right angle? Which statement is true for a [math]100deg[/math] angle? The angle is a right angle. The angle is [math]10/360[/math] of a circle. The angle turns though 100 1-degree angles. Angles adjacent to the same angle and forming linear pairs with it.